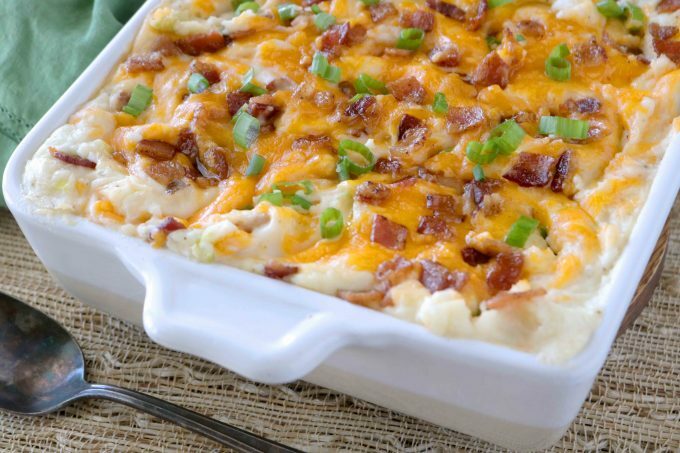 A recipe for loaded mashed potato casserole, featuring cream cheese, crispy thick-cut, bacon, freshly grated Cheddar, and chopped green onions. 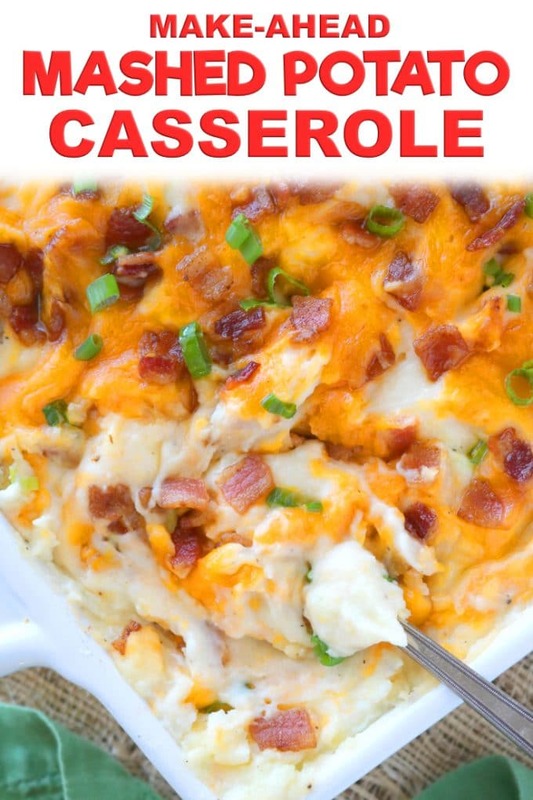 The perfect make-ahead side dish casserole! If you’re on the hunt for a casserole to blow all other casseroles out of the water, you have come to the right place. 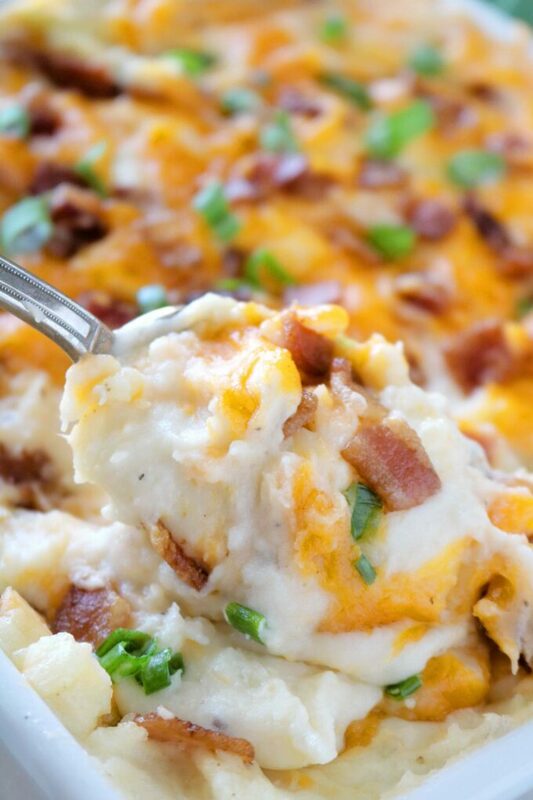 Mashed potatoes are just fine and dandy on their own, but how could you compete with loaded mashed potatoes? Sorry other casseroles. Y’all just can’t. Thick-cut, crispy bacon, melty Havarti cheese, flavorful Cheddar, and chopped green onions are speckled throughout a base of mashed potatoes, made uber creamy via the addition of butter (duh), and the kicker, cream cheese. I used to make a stovetop version of these potatoes years and years ago for holiday gatherings, and the whole family would look forward to scooping up a generous portion to plop down beside their turkey or ham. However, what I didn’t like about the recipe was that it needed to be made at the last minute because unfortunately, it just didn’t keep all that well. It wasn’t until I was reading through one of my favorite cookbook author’s (Mr. Rick Rogers — a chef after my own heart) cookbooks, and his recipe for “Make-Ahead Mashed Potato Casserole” caught my eye. The recipe had all of the same elements of my holiday loaded mashed potatoes, however, he had incorporated cream cheese into his recipe. And, it just so happens, the cream cheese makes all the difference in the world. The cream cheese is an extremely important aspect of this recipe, as it keeps the potatoes from drying out, making this the perfect make-ahead potato casserole. Did this recipe just get even better?! Yes. I do believe it did. We could all use a little more make-ahead in our lives, am I right? Or, am I right? 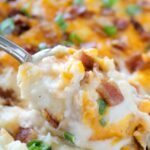 Loaded Mashed Potato Casserole is perfect for Thanksgiving day, a potluck barbecue or even as a ready-made side dish to help you with dinnertime throughout the week, and you can count on this recipe to show up and show out. It feeds a crowd, is over-the-top savory, and tastes just as good the next day as it did the first. Prepare yourself for rave reviews, seconds and thirds. Please, enjoy. A recipe for loaded mashed potato casserole, featuring crispy thick-cut, bacon, freshly grated Cheddar cheese, and chopped green onions. Preheat the oven to 350° and have ready a greased 8x8" baking dish. In a large sauté pan over medium-high heat, saute the cubed bacon 6-8 minutes, or until crispy. 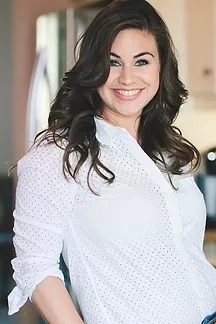 Transfer to a plate lined with paper towels and set aside until ready to use. Add potatoes to a large pot, and cover with water by 1 inch. Place over high heat and allow to come to a boil. Boil the potatoes until fork tender, about 20 minutes. Strain the potatoes and add them back to the pot. Add cream cheese, milk, butter, salt, and pepper to the potatoes. Using a handheld mixer on medium-low speed, mix until well-combined. Do not overmix. Using a sturdy spoon, stir in the Havarti cheese, 1/2 cup of Cheddar, half of the bacon, and about two-thirds of the green onions. Transfer to the prepared dish. Cover with aluminum foil and bake for 20 minutes. Remove potatoes from the oven and sprinkle the top evenly with remaining Cheddar, bacon, and green onions. Return to the oven, uncovered, and bake for 10 minutes more, or until the cheese is melted and bubbly. Serve and enjoy. Do not overmix the potatoes with the mixer, or they will be chewy. You can prepare the casserole a day or two in advance. To do so, prepare the potatoes up until the point of baking, cover and refrigerate. Set the potatoes out about 45 minutes before baking to remove the chill. Resume with the recipe, and bake as directed. There are so many things that I love about this recipe! First of all, I LOVE that it can be prepared ahead of time. Then there is the delicious cheese… oh and that BACON! Yum! This recipe is definitely going for the win. After all you can’t go wrong with the combo of bacon, cheese and potatoes. Such a comfort food! Bacon is life! Never thought about cream cheese and cheese together with potatoes. Oh, that is a HUGE idea! So simple, yet so huge! A lot of great inventions are just that, aren’t they? Simple, yet huge! Cream cheese in the mashed!! Huge!! 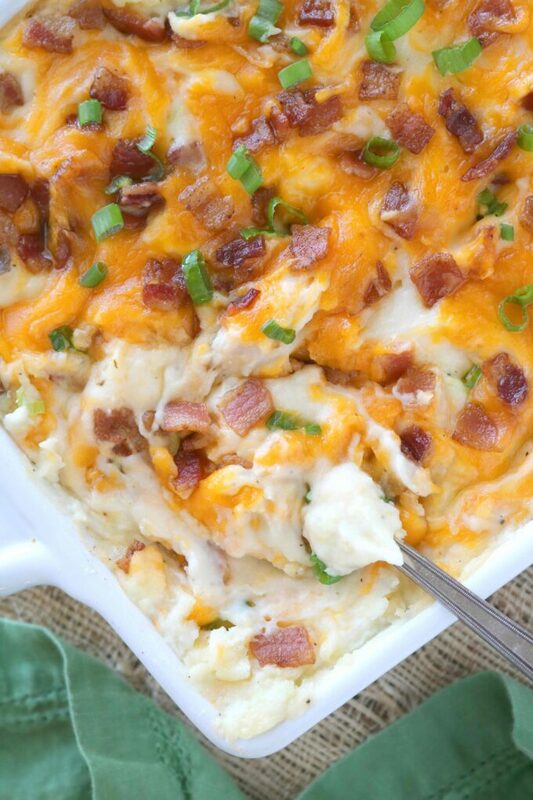 This mashed potato casserole is making me excited about the upcoming ‘comfort food’ season. So loaded with goodness I can’t wait to make it.